Ferrari has been on an unusual tear of releasing new models. 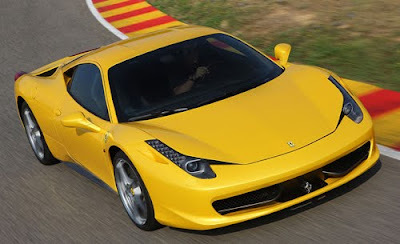 Last year, we were treated to the California convertible, and now we get the 458 Italia. This new mid-engine two-seater is radical looking no matter which angle you view it from. From the front, the trailing headlight LEDs and strange eyelit vents are completely original and quite outrageous. While they’re unique looking, they still speak to the Ferrari faithful. Far more provocative, however, is the rear and its voluptuous fender. The profile — it’s hard to find a good profile image from the manufacturer — is probably the shot that’s most distressing to Ferrari fans because the back half looks enormous compared to the car’s hood. From straight on, the back’s protruding taillights and trio of exhaust pipes are also slightly bizarre. Pentastar wheels are the only traditional touch we can see. Of course, it’s still a Ferrari and that means it can perform as well as strain gawkers’ necks. The V-8 engine is good for 562 horsepower and a zero-to-62 time of 3.4 seconds, which is about as fast as anyone can expect to go in a car today that doesn’t shoot flames out the back. A seven-speed dual-clutch transmission is controlled only by paddle shifters on the Formula One race-inspired steering wheel, and dual electronic gauges frame a center tachometer, which says this is a serious performance machine. Because the engine sits behind the seats weight is balanced 42/58 front to rear, which should make for fun days on the track. More photos below.